Musical Interlude: Hit The Road Jack (Lah)! I'd have to pack my things and go. That's right. Don't care if you do 'cause it's understood. A country is oftenly refered in the feminine gender. This song is thus about the disappointment of a country and its people to its leader. A leader who has failed and betrayed the nation and its people. This song is dedicated to that disillusioned leader foolishly misguided by a bunch of arrogant young punk. If this posting is what MSN reported he said yesterday of "keterlaluan", so be it. It'ss the truth and he has to face it! You have not shown sensitivity to the predicament of the people. You have not been handling and giving attention to solve the problem of the people. You have not shown any ability and wisdom in doing your job. You have not delivered your promises! You have perpetuate corruption amongst family and friends! You have been an embarassment to the faith, race, party and country! Don't give me anymore of your crapy cliches and slogans. I've had enough. It means nothing now. Irrelevent! You have compromised the country! 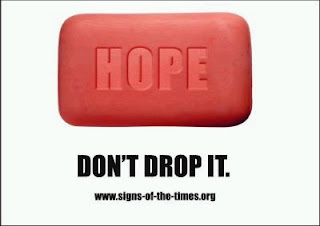 You have not resisted but conformed to pressure and prescription from the outside interest. You have caused more destruction to the faith, race, nation and party! Please realised its time to find the door out. Its the same one you entered. Please don't come back any more. You can be in Australia. You can be flying in your son's private jet acquired through devious ill gotten way. 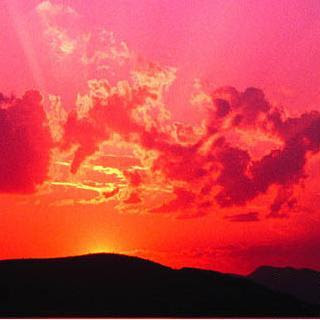 Heaven's, I do not care anymore. Please stop thinking good about yourself. Stop disguising as a pious man facade. Its a fake job. Stop flaunting around with your nice guy. You should remain a nice guy and retired. Do yourself some sensibility to stop listening to those so-called words of support from so-called supporters claiming to so-called represent the so-called people. They are merely pea-brained imbeciles and opportunist you have been surrounding yourself with. Their presence has no consequential benefit and mere dissillusioning you with their ball lickings. Do yourself the honour to resign than being the first PM to be kicked out of office! You are just incompetent. The truth to the matter is you have been a Malaysian Disaster. To safeguard the faith, people, nation, and party, your service is no more required and your so-called "perjuangan" was mere lip service and sloganeering, devoid of substance. Your absence will do less damage than your presence. As it is, the damage of your four years will take more than a decade to repair. Resign now or you will be remembered in the history for ruining 50 years of re-independence! Even if one disagree to the specifics or think it's a good yarn, it's worth to read Jeff Ooi's Father-in-Law and Son-in-Law Berhad with link to Steven Gan's An Incompetent Not-So-Nice Guy to Malaysiakini (republish below). There is a fair amount of truth in its main assertion. It's remarkable that it took this long for some to see the real Abdullah Ahmad Badawi. Then again, perhaps not. After all, his American-style spin-doctoring pulled enough wool over our eyes. Still, the chink in Abdullah's armour is beginning to show and this has given away his game. Indeed, the prime minister is becoming a victim of his own elaborate ‘spin’. Increasingly, Malaysians are questioning his leadership when previously few dared to without ending up looking foolish, as Abdullah is still enormously popular. But it's there for all to see - his sloth-like administration, his flip-flopping in decision-making and his seeming disinterest in state affairs. This month, Abdullah reached a milestone - on Nov 1, he marked four years as PM. It passed without much fanfare as there's really little to celebrate. Abdullah is arguably the most incompetent PM we ever had. He has just sleep-walked his way through his first term. When he took over from Dr Mahathir Mohamad, he promised Malaysians the sky - he vowed to wipe out corruption without fear or favour, he asked everyone to tell him the truth even if it hurts, and promised to rid the country of racial and religious polarisation. Surely, Abdullah must be kicking himself now. You don't promise what you cannot deliver. He should have known that he cannot root out corruption without weeding out the real source - the patronage politics in Umno and its sidekicks within the ruling Barisan Nasional coalition. Moreover, his dilly-dallying over acting on the Lingam tape and his sledgehammer approach to the Bersih and Hindraf protests are the latest in a string of decisions which have let down many, including those who gave him a huge mandate in the 2004 election. When he moved into his official resident, Seri Perdana, four years ago, Abdullah might have hoped to emulate Junichiro Koizumi - the maverick Japanese leader who led his party to one of the biggest electoral victories in the nation's history and decisively sacked party leaders who opposed his reforms. But he is no Koizumi. Clearly, Abdullah is stumped by his inability to galvanise his own party, let alone the nation. To paper over his weaknesses, his minders have seen to it that he does not put his foot in his mouth too often on policy issues. When he does give the rare press conference - and it's getting more infrequent by the day - journalists are told to stay away from 'no go' areas. Worse still, his ‘elegant silence' administration has been hijacked by two self-appointed spokespersons – de facto law minister Mohd Nazri Abdul Aziz and information czar Zainuddin Maidin. It cannot get any worse than this. Abdullah should realise that his real enemies are not his critics but his sycophants. 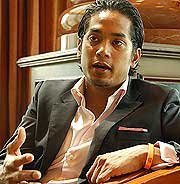 Indeed, his Achilles' heel is one of his most trusted confidants, son-in-law Khairy Jamaluddin. Khairy has openly conceded that he needs his father-in-law to ‘protect' him while he plots to take over the country's top job within the next 10 years. He is painfully aware that the moment Abdullah steps down, he can kiss his ambitions goodbye. For Khairy's plan to work, Abdullah must hold on to his job for at least another term. That should provide this 30-something politician the ‘protection' he needs to climb up the party hierarchy and shore up his political support. He has one major problem though - with deputy Umno president Najib Abdul Razak next in line to take the reins, Umno Youth chief Hishammuddin Hussein stands out as Khairy's most immediate rival. As Najib's cousin, Hishammuddin is the most obvious successor. This could potentially leave Khairy (right) out in the cold. So expect Khairy to work overtime to ensure that Hishammuddin not elected as one of the three party vice-presidents in the next Umno polls. With his key rival out of the way, Khairy - who will be installed as Umno Youth chief - will be right on track in his quest for power. This explains why Abdullah cannot rock the boat too much by rubbing up the party chieftains the wrong way - hence, his uninspired leadership. So Abdullah is no Koizumi. But at least, he can be Habibie. 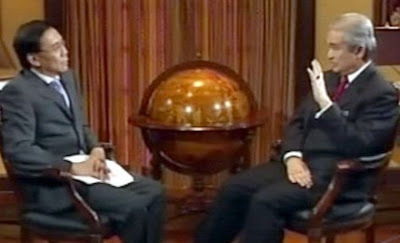 BJ Habibie was the accidental president in post-Suharto Indonesia. In the one year he was in power, he initiated poll reforms, liberated the media, free political prisoners and let East Timor go. Not bad for a colourless technocrat. Abdullah could still be the bureaucrat to bring similar reforms in Malaysia. That is, if his son-in-law allows him to. Perhaps, many would not have similar concerns with that of Steven Gan's. Nevertheless, all Malaysian have each their own. 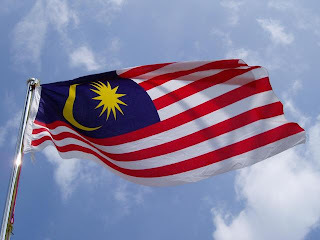 Pak Lah's leadership have miserably failed to sensitized, if not address, the concerns of ordinary Malaysians concerns. Pak Lah has demonstrably shown he is incapable of pre-empting problems from overblowing into a bigger mess. Just observe his slow responses and delayed announced positions on challenges to the Constitutionalised Social Agreement (Contract), inflation and the spiraling price of goods and services, Economic Corridors development plan, and many many more matters. Many segments of society have lost patience and are uninhibited to air out their grievances. Despite the illegal status and shortcomings in the demands of all the rallies held thus far, there are evidences to suggest that these rallies became the venue for public dissatisfaction. Apparently there are those that march for purposes different from each rally's purpose. 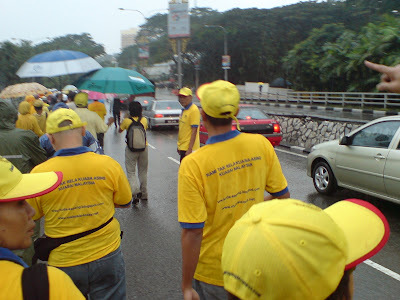 The yellow march attracted protestors concerned with foreign insurption in the administration (Click the picture above to see the back writings of this non Bersih yellow shirts). Its believed that the rally attracted UMNO members and retired servicemen too! Despite the claimed "racist" and "seditous" demands of Hindraf (read Rocky Bru's here and here and A Kadir Jasin's here), the Hindraf rally attracted non Hindu protestors giving support for their right to assembly and sympathisers for the disenfranchised poor Indians (wait for my scorecard in my next posting). Pak Lah have ignored and failed to pre-empt all these grumbling on the ground. Despite claim for being a PM to all races amongst his flood of taglines and immediately attended a fertilisers subsidy handover event a day after the power handover in 2004, his lackadaisical habit actually reflect that he is not sensitive to the plight and concern of the peoples as he project and claim himself to be. Blogger Si Bongkok Tanjung Puteri concluded here that Pak Lah inability to practise and handle the openness policy he promoted has caused more problems. Its not the openness policy that is at fault, its just his "plain jane" incompetency. Delve into every other claims of his, its guarantee to show his inconsistency and contradiction. Blogger Politica was already on a resignation call since last Friday here. He or her's assertion shows many similarity. It's Pak Lah's contradictions and Khairy Jamaluddin (and son's business partner Patrick Lim). Enough, you are just indefensible. Just "Hit the Road, Lah!". Tulisan oleh Johari Ismail, seorang ahli UMNO yang baru-baru ini membuat laporan polis terhadap Pak Lah dijumpai di blog Si Bongkok Tanjung Puteri. Dalam penjelasannya, tujuan laporan itu dibuat bukan setakat satu infringement kepada peraturan Pendaftar Pertubuhan sahaja. Johari telah menyampaikan perkara-perkara yang menjadi kebimbingan dan kini adalah intipati perjuangan mereka-mereka yang begitu prihatin dengan permasaalahan terkini negara ini. Pucuk kepimpinan Pak Lah sering dipersoalkan dari segi kecekapan pentadbirannya, ketirisan dalam perancangan dan implementasi, deliverability kepada terlalu banyak slogan-slogan lepasnya, kelemahan peribadi kepimpinan, kenyataan-kenyataan dan tindakan-tindakan lucu dirinya dan para sidang Menteri dan kepimpinan UMNO, dan lain-lain. Walaupun ianya sudah jelas, ada faktor overriding yang lebih ketara dan susah untuk di pertikaikan. Masaalah utama Pak Lah adalah penyerapan anasir-anasir luar kedalaman pucuk kepimpinan negara dan parti yang sedang merubah dan menghancorkan dengan drastik asas struktur politik, sosial, dan ekonomi negara. Bermula dari skandal nuklear Scomi, penahanan BSA Tahir di bawah ISA, penangkapan eksekutif utama syarikat Mitotoyo di Jepun, skandal Oil for Food dan dikatakan dana asing membantu kenaikkan poltiknya, sedikit demi sedikit Pak Lah sudah akur kepada agenda asing. Perkara ini menjadi lebih kritikal dengan budaya hedonisme dalam politik UMNO yang kini sudah di tahap yang amat meruncing sekali. 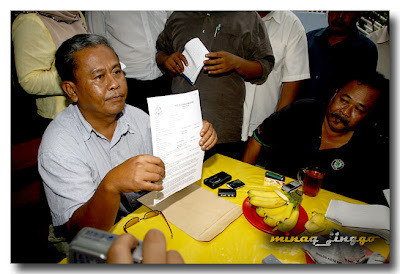 WALAUPUN laporan polis yang telah saya buat di Balai Polis Daerah Dang Wangi, Jalan Raja Abdullah, Kampung Bahru, Kuala Lumpur pada tanggal 6 November 2007 lalu berkisar pada dakwaan bahawa Presiden UMNO, Dato’ Seri Abdullah Ahmad Badawi (Pak Lah) telah, secara jenayah, mengarahkan dikecuali (expunge) tiga muka surat minit mesyuarat yang telah direkod pada mesyuarat Majlis Tertinggi (MT) UMNO 28 Ogos 2006; tetapi motivasi sebenar di sebalik tindakan tersebut adalah lebih dari itu. Memandangkan tiga muka surat minit mesyuarat yang didakwa dipenyapkan atas arahan Presiden UMNO Ke 6 itu kononnya mengandungi arahan supaya digagalkan usaha oleh mantan Presiden UMNO Ke 5, Tun Dr Mahathir Mohamad untuk menjadi perwakilan UMNO Bahagian Kubang Pasu ke Perhimpunan Agong Tahunan UMNO 2006, maka umum pasti mengandaikan bahawa tindakan membuat laporan polis ini adalah semata-mata bagi membela atau menyatakan sokongan dan simpati terhadap negarawan besar kita itu. Andaian tersebut tidak ada cacat celanya tetapi motivasi sebenar yang mengerakkan tindakan sedemikian adalah perasaan aib dan malu yang terpaksa ditanggung diri sendiri. Sebagai anak Melayu-Islam jati dan ahli UMNO, saya tidak dapat tidak merasa cukup aib melihatkan pucuk kepimpinan bangsa, parti dan negara mutakhir seolah-olah sengaja membiarkan diri diperkotak-katik oleh mainan dajjal suatu kuasa politik asing yang telah sekian lama menjadi nanah atau pekung berbisa di dalam politik-ekonomi Malaysia dan bangsa Melayu-Islam. Semua ini dilakukan semata-mata kerana dijangkiti kategori penyakit mabuk yang paling dhaif, yakni mabuk kuasa. Justeru, apa yang mengerakkan saya untuk membuat laporan polis berkenaan – malah langkah-langkah seterusnya di masa akan datang, jika perlu – dengan tepat dan jelas telah dipaparkan oleh seorang blogger yang menggelarkan dirinya Kapten Bersara. 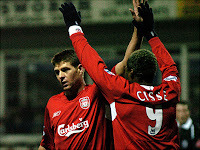 (http://www.kaptenbersara.blogspot.com). Rakyat Malaysia khasnya pemimpin-pemimpin UMNO dalam barisan Imam Hadhari sedang diperolok-olokan oleh Lee Kuan Yew dengan permainan Saikoloji Songsang (Reverse psychology). Menurut kamus Wikipedia: “Reverse psychology is the term that describes the outcome where advocacy of one course of action persuades another person to do the opposite”. Secara ringkasnya Saikologi Songsang (SS) ialah sebutan bagi kata-kata atau tindakan yang dilakukan dengan sengaja yang bertujuan mendapatkan tindakbalas atau reaksi yang bertentangan. SS bukan perkara baru bagi kaum China. Ia merupakan strategi yang ke 32 dari sebanyak 36 strategi peperangan yang diamalkan oleh orang-orang China sejak tahun 219 sebelum masihi (SM) lagi (Si Bongkok: Sila rujuk “Arts of War” oleh Sun Tzu). SS bukan perkara baru bagi kaum China. Ia merupakan strategi yang ke 32 dari sebanyak 36 strategi peperangan yang diamalkan oleh orang-orang China sejak tahun 219 sebelum masihi (SM) lagi. Ada banyak contoh yang boleh dikaitkan dengan SS ini, tetapi contoh paling mudah ialah “The Empty Fort Strategy”. Dalam peperangan Hanzhong pada tahun 219 SM, apabila tentera Cao Cao menyerang pertahanan tentera Liu Bei, mereka mendapati kem Liu Bie senyap sunyi serta pintu kotanya terbuka luas tanpa sebarang pengawal. Ini membuatkan tentera Cao Cao mengesyaki kem itu sedang dijadikan sebagai perangkap untuk mereka, lalu mereka tidak jadi masuk dan berundur dari situ. Strategi bersembunyi dan membuka pintu kota tanpa pengawal telah menyebabkan tentera Liu Bie selamat dari serangan itu, walaupun bilangan mereka lebih kecil dan lemah. (Si Bongkok: Wilayah Pembangunan Iskandar; satu koridor pembangunan penuh tanda tanya di selatan negeri Johor Darul Takzim yang bersempadanan dengan Singapura), sebenarnya bertujuan mengukuhkan kedudukan PM Abdullah yang sedang beliau jadikan “kuda tunggangan” bagi menjayakan hasrat dan niat jahat Singapura di dalam IDR. Lee Kuan Yew tahu bahawa sebagai reaksi sepontan pemimpin-pemimpin (setengah masak) UMNO Johor akan berebut-berebut membuat kenyataan menafikan kata-katanya itu. Seperti biasa ini akan disusuli pula oleh majlis-majlis dan perhimpunan-perhimpunan besar-besaran anjuran UMNO Johor bagi menyampaikan ikrar taat setia dan sumpah teguh berdiri di belakang PM Abdullah dan menyokong penuh IDR. Inilah tujuan sebenar kenyataannya itu dan perangkapnya nampaknya sudah mengena dengan mudah. Kita ambil satu lagi contoh tindakan Saikoloji Songsang apek tua yang licik ini. Beliau telah menggunakan akhbar Berita Harian dan Straits Times untuk menyatakan kebimbangannya mengenai tahap keselamatan di Johor, ekoran beberapa “kejadian-kejadian” jenayah yang dilaporkan sendiri oleh akhbar-akhbar tersebut. Ini dikuti oleh suara-suara menyokong dari berbagai pihak termasuk pemimpin (setengah masak) UMNO sendiri. Seperti yang dijangkakan, PM Abdullah mengarahkan KPN menghantar 70,000 anggota tambahan ke Johor. Nah! inilah hajat sebenar mereka. Rakyat Singapura tersenyum sampai ke telinga melihat PDRM menjadi pengawal keselamatan mereka secara percuma. Banyak lagi contoh yang boleh diteliti bersama seperti kata-kata bahawa “Singapura akan kehilangan industri”, “menghadapi “masalah pengangguran”, tidak mendapat “layanan istimewa” dan berbagai-bagai lagi. Kita lihat perkataan-perkataan “lawan” atau “songsang” kepada “hilang” lawannya “jumpa”. Perkataan “menganggur” lawanya “ada banyak kerja”, perkataan “tidak dapat" lawannya “dapat” layanan istimewa. Sampai bilakah kita membiarkan diri diperolok-olokan sebegini. Adakah mana-mana pemimpin selain dari Tun Dr Mahathir yang mampu “mengajar” si apek tua ini. Hatta, saya ingin mencelah sekali lagi bahawa darah UMNO dan Melayu-Bugis yang pekat mengalir dalam diri ini sejak zaman ayahanda Allahyarham Cikgu Ismail Timan (anggota lapisan perintis Pergerakan Pemuda UMNO Malaysia); bonda tersayang, Cikgu Habibah Yahaya yang merupakan salah seorang perintis Kaum Ibu (Pergerakan Wanita UMNO); dan ninda saudara, Allahyarham Dato’ Ali Raya (Speaker Dewan Undangan Negeri Johor berbangsa Melayu yang pertama), telah menggerakkan saya melakukan apa yang telah saya lakukan pada tanggal 6 November 2007 – tanpa sebarang rasa penyesalan dan prejudis secara peribadi terhadap mana-mana pihak. Tekad ini terbina atas kesedaran bahawa sepak terajang politik di dalam UMNO masa kini kian dipenuhi kedurjanaan: persekongkolan, sama ada secara sedar atau tidak, dengan tangan-tangan halus musuh utama umat manusia yakni kuasa Yahudi-Nasara Anglo-Amerika-Zionis Israel dan sekutu boneka utama mereka di rantau ke timur Terusan Suez, Singapura. Saya penuh yakin bahawa kedurjanaan yang sedang berlaku di kalangan segelintir anggota pucuk kepimpinan UMNO dan negara masa kini pasti lambat laun akan melenyapkan penguasaan parti karamah ini ke atas rakyat dan negara. Tanda-tanda jelas ke arah ini telah pun menjelma sejak akhir-akhir ini dalam pandangan kalangan anak bangsa yang telah sekian lama terguris suara hati atau conscience mereka – satu keadaan spiritual yang hanya mampu dialami oleh kalangan bertuah yang dapat menjalani proses pendewasaan tidak bertentangan dengan fitrah insaniah dan berpegang teguh pada tekad haqqul yaqeen, yakni keyakinan pada yang hak. Ketika dibesarkan di dalam suasana keluarga pendidik sekolah atap dan, seterusnya, semasa menjalani alam persekolahan, saya sentiasa dipupuk untuk menilai antara yang hak dengan yang batil (differentiating between wrong and right). Ketika itu kami tidak jemu-jemu diterapkan dengan jiwa untuk bersikap berani kerana benar dalam menghadapi apa sahaja suasana kehidupan mendatang. Maka proses pembesaran seperti inilah yang bertanggungjawab membentuk pandangan hidup saya dalam sebarang interaksi dengan masyarakat, dan ini termasukah dalam kancah siasah. Namun kini dengan apa yang dilihat sebagai berlakunya penghakisan serius terhadap moral ascendancy atau ketuanan akhlak UMNO – sebagai wadah utama politik anak bangsa Melayu – apa yang diterap ibubapa dan guru semasa dibesarkan dulu sedang cepat bertukar menjadi kekeliruan atau disillusionment yang maha hebat. Kini perkataan murni seperti idealisme perjuangan dan kekentalan moral atau moral uprightness “dimatikan” dengan pelbagai dogma politik, sosial dan ekonomi melulu – terutamanya yang dipasangkan dengan hal ehwal hukum hakam keagamaan sendiri – yang direka-reka sesuka hati dan nafsu mengikut keperluan matlamat menghalalkan cara ala falsafah machiavelli legasi era zaman pembaharuan Yahudi-Nasara di Eropah. Akibatnya maka bermaharaja lela fahaman kebendaan atau materialisme yang menzahirkan budaya korupsi, kolusi dan nepotisme yang kesemuanya wujud demi memenuhi gaya kehidupan songsang hedonisme yang menetapkan keseronokan duniawi sebagai matlamat utama kehidupan. Budaya kehidupan hedonisme yang lahir dari amalan-amlan korupsi, kolusi dan nepotisme begitu kritikal hingga semangat perjuangan sudah begitu tertiris hingga kepentingan diri untuk harta, kuasa dan gaya hidup telah menikus dan menyeyapkan orang-orang UMNO dari menyuarakan tentangan. Malayan Union merupakan pencetus penubuhan dan perjuangan UMNO pada tahun 1946. Kemasukkan Singapura ke dalam Malaysia pada tahun 1963 membawa sekali Malayan Union ke II berupa doktrin Malaysian Malaysia yang masih belum dikebumikan. Anih dan penuh ironis, dengan protoganis yang sama UMNO pula yang menjadi pelopor Malayan Union ke III. Ianya adalah Koridor Ekonomi Pak Lah dan mangsa paling teruk adalah WPI. UMNO hanya diam, akur dan "saya sokong". Kesetiaan Hang Tuah yang membawa kehancuran. Blog Si Bongkok sedang menerbitkan 10 siri berkenaan WPI (Bahagian Pertama boleh di kerlip di sini). Sila mampir. Semuga perjuangan ini di reda Allah. Ameen. Catatan Ku: Apa Kata Pakai Merah di Hari Jumaat? Susulan peristiwa 10-11 (atau Perhimpunan Bersih) pada hari Sabtu lepas, timbul polemik dan perdebatan mengenai permit polis, hak berhimpun, kuasa polis menyurai, tuduhan kekasaran oleh polis, pembabitan Raja-Raja Melayu, dan lain-lain. Pelbagai kenyataan-kenyataan yang membawa pelbagai maksud, interpretasi dan ada yang melucukan telah dikeluarkan oleh pelbagai pihak - istana, kerajaan, penganjur, parti-parti politik, dan rakyat jelata. Kalau semasa zaman reformasi dahulu, penulis adalah penentang tindak-tanduk politik jalanan yang berlaku susulan pemecatan Dato Seri Anwar Ibrahim. Secara ikhlas, kali ini penulis bersikap agak tawar untuk bersungguh-sungguh mempertahankan dan berhujah untuk Abdullah Ahmad Badawi. Apa ertinya untuk penulis mempertahankan kerajaan kepimpinan Abdullah Ahmad Badawi? Secara langsung, tindakan mempertahankan akan diputarbelit sebagai memberi legitimasi kepada kepimpinan dan tindak tanduk Dato Abdullah Ahmad. Dengan mempertahankan Dato Abdullah Ahmad, ia bermakna bersekongkol mempertahankan kelemahan dan kecuaian kepimpinannya; amalan korupsi yang berleluasa; ketidak cekapan pentadbirannya; polisi-polisinya yang menjejaskan kedaulatan negara, negeri dan masa depan orang Melayu; amalan pembohongan yang lazim oleh pucuk kepimpinan; dan meleluasakan amalan nepotisma. Penulis tidak rela melakukan perbuatan sedemikian. Di bawah kepimpinan Abdullah Ahmad Badawi, negara, bangsa, agama dan parti UMNO sudah tidak disegani dan dihormati. Kelalaian, sikap ambil mudah dan penyerahan penuh perjalanan parti dan kerajaan pada kaum kerabat dan sahabat-sahabat tertentu telah meniriskan perjuangan asal parti untuk memertabatkan agama, bangsa dan negara. Abdullah tidaklah seterbuka, setulus, dan sedemokratik yang dia war-warkan. Suara ahli UMNO dan rakyat tidak mahu didengari. Beliau menyuruh Menteri dan Pegawai Kerajaan mengistiharkan harta tetapi tidak untuk dirinya. Bukan sahaja amalan demokrasi tidak dipertingkatkan, tetapi telah dimatikan dalam UMNO. Kepimpinan Abdullah Ahmad Badawi adalah satu pengkhiantan (betrayal) kepada agama Islam, bangsa Melayu dan tanahair Malaysia. 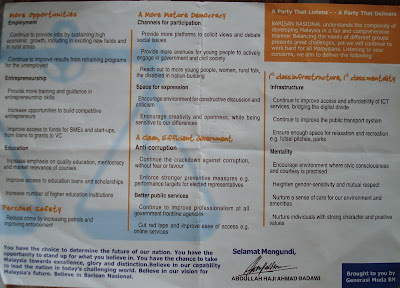 Janji-janji dalam manifesto pilihanraya tahun 2004 semua tidak dipenuhi walaupun dia mengaku telah penuhi. Melalui WPI, kepentingan rakyat Johor telah diketepikan, dan kedaulatan negeri dan negara telah dipertaruhkan untuk menarik pelaburan Singapura. Keadaan pemerintahnnya kucar kacir dan tiada hala tuju yang jelas. Walau apa sekali pun, penulis tidak sedia melihat UMNO jatuh. UMNO sahaja satu-satunya wadah perjuangan kebangsaan Melayu dan pembela Islam yang berkesan di negara ini. Hanya kepimpinan parti UMNO sahaja yang akan dapat membawa kemajuan dan keadilan yang hakiki di negara ini. UMNO sebagai parti pemerintah dan pemimpin kepada gagasan Barisan Nasional sepatutnya sedia memperbaiki kepincangannya. Kepentingan diri tidak seharusnya mendahului tanggungjawab dan perjuangan. Keresahan, peringatan dan teguran rakyat dan ahli-ahli UMNO tidak boleh tidak diambil peduli oleh kebanyakkan pemimpin-pemimpin tertinggi UMNO. Ramai antara mereka yang leka dan tamak mengejar harta dan pangkat hingga cuai dalam tanggungjawab dan perjuangan. Di peringkat akar umbi, kebanyakkan ahli-ahli UMNO sedar akan masaalah yang ditimpa negara, prihatin terhadap keresahan rakyat jelata menghadapi kenaikkan harga barangan, simpati kepada para peniaga yang begitu pahit meghadapi suasana ekonomi yang muram, profesional yang telah dibuang kerja, dan kedaulatan negara yang terhakis. Keresahan dan keprihatinan ahli-ahli UMNO biasa sering tidak diambil endah. Suara mereka di majlis parti ditahan dari keluar ke pengetahuan cawangan, bahagian dan parti. Suara akar umbi tidak langsung dihormati. Gelombang Kuning kini mahu dijadikan manifestasi keresahan rakyat dan simbol protes terhadap kepimpinan Abdullah bin Ahmad. Kempen terbarunya adalah memakai kuning pada hari Sabtu. Kuning suatu warna yang membawa suasana keceriaan dan menjadi simbol kepada pembaharuan dan harapan. Ini lebih baik dari mengadakan perhimpunan awam yang haram yang boleh mencetus kepada keadaan anarki dan kurang selamat kepada awam. Gelombang kuning harus bersih dan sifar dari imej dan agenda berbau politik kepartian. Ia perlu benar-benar mencerminkan gelombang suara ketidak puasan hati rakyat dan bukan coup d' etat atau menghidupkan kembali absolute monarchy atau membawa suasana anarki dalam negara. Walaupun Perhimpunan Aman Rakyat yang merupakan pemula Gelombang Kuning mungkin tercemar dan terculik, namun semangat keresahan rakyat harus di beri perhatian. Dikhabarkan kepada penulis, ramai ahli-ahli UMNO yang ikut bersama di Perhimpunan Sabtu lepas. Penglibatan mereka mungkin agak tidak bersesuaian dari kacamata UMNO, tetapi keprihatinan mereka tidak boleh diketepikan begitu sahaja dan pasti tujuan mereka bukan selari dengan tujuan Bersih yang agak samar-samar. Jika Dr Mahathir, seorang negarawan, pun disekat sana sini untuk memberi teguran, pasti banyak ahli sudah terfikir apa pula diri mereka? Mungkin, perhimpunan itu sahaja cara mereka boleh meluahkan rasa ketidakpuasan hati. Penulis sendiri pernah secara tidak diatur berarak bersama parti pembangkang di bawah banner NGO menunjuk perasaan terhadap perbuatan akhbar NSTP menghina Nabi Muhammad kerana UMNO hanya menunjukkan bangkangan yang hanya token sahaja. Kekangan sistemik yang dilakukan terhadap ahli-ahli UMNO tidak bermakna keresahan para ahli UMNO tidak boleh diluahkan. Satu cara perlu dilakukan untuk keresahan akar umbi dapat disedari pucuk kepimpinan parti dan seterusnya membawa perubahan yang baik. Mereka sudah tidak boleh mengambil sikap apologetik dan menafikan keadaan tenat dalam parti. Apa kata hari Jumaat menjadi hari "Gelombang Merah" bagi ahli-ahli, pejuang-pejuang dan pecinta-pecinta UMNO meluahkan ketidak puasan hati mereka dengan memakai sesuatu yang merah. Gerakan simbolik ini menyerupai "civil disobedience" ala Gandhi yang lebih aman. Warna merah itu memberi perbezaan sedikit kepada suara ini. Warna merah memang sudah warna simbol perjuangan UMNO. Merah itu juga warna keberanian, dan perjuangan. Pada hari Jumaat sekurang-kurangnya, pakai sesuatu yang berwarna merah – baju, baju kurung, tali leher, tudung, skaf, sweater, vest, tie pin, dan kasut wanita. Jika “Gelombang Merah” ini pula begitu signifikan kelihatan, kita boleh bersama menyedarkan pucuk kepimpinan parti. Dengan perbuatan yang sedikit usahanya, mungkin kita boleh menyelamatkan agama, bangsa dan negara. Tidak ada undang-undang yang boleh menyekatkan kita untuk memakai sesuatu yang merah. Baik undang-undang negara atau undang-undang parti. Tidak ada undang-undang yang boleh menahan kita sama-sama menyuarakan ketidak puasan hati kita! Kita tidak melanggar mana-mana undang-undang. Mari bersama-sama memakai merah sekurang-kurangnya di hari Jumaat! Apa kata? Ide ini bukan merupakan ide asli penulis tetapi diilhamkan dari blog Gerbang Ruhanie dan perbincangan di Forum MyKMU. Maaf kerana tidak memberi penghargaan yang sepatutnya. "This song is called Betrayal, specifically dedicated to John Kerry for bowing out of the election all too soon." As we listen to the video, read Frank P Whyte of AuthorsDen.com same titled poem and ponder over betrayals done over us. In the orchestra of life. "So I might explain why you are wrong. That are searching for a soul. In the valley of disregard. Who brought me to this barren wasteland. When evil lies before me and not within? It has an evil twin. With those who would wield the saber. And a hatred born of lies. Tragic death without a crime. When I know that I've been betrayed. From those who have sprung the trap. And I feel the stones as I am tied to the stake. Sikap Perdana Menteri, Datuk Seri Abdullah Haji Ahmad Badawi (Pak Lah) tidak melenting dengan kritikan bekas bossnya, Tun Dr. Mahathir Mohamad wajar dipuji. Bagi Pak Lah, bekas Perdana Menteri itu bebas bercakap apa sahaja termasuk melemparkan kritikan pedas terhadap beliau kerana Malaysia adalah negara demokrasi. Penulis rasanya kenal saudara Zabidi ini. Mengikut Kod Da Vinci kami, Zabidi dan penulis adalah saudara sekawah. Kami sama-sama punya semangat ingin ambil tahu berkenaan isu semasa sosio-politik negara. Pada tahun 1984, kami bersama menyumbang menubuhkan sebuah NGO yang kini telah bercambah, besar dan dikenali ramai. Untuk membaca tulisannya sepenuh, kerlip terus ke laman UMNO Reform sini. Banyak sekali peristiwa telah berlalu sejak tulisan beliau. Apakah pendirian beliau kini? Harapnya saudara penulis ini tidak leka dan lupa dibuai tiupan bayu di negeri ulik mayang yang panjang pantainya. Jangan terlupa peristiwa Tun Dr Mahathir disembur racun di Kota Baru pada bulan March 2006 untuk memastikan acara syarahannya tergendala. Jangan terlupa usaha terancang dari UMNO Ibu Pejabat dan Negeri Kedah untuk memastikan Tun Dr Mahathir tidak terpilih mewakili Bahagian Kubang Pasu sebagai perwakilan ke Perhimpunan Agung UMNO 2006. Jika di usaha, pasti boleh terjumpa di Internet, surat Dr Mahathir bertarikh November 3hb memberitahu penggunaan pelbagai cara untuk menahan 14 acara majlis syarahan Dr Mahathir. Adakah ini namanya keterbukaan, ketulusan dan kedemokrasian? Ah, mungkin ini cerita lama dan sudah tidak releven kepada suasana terkini. Jika cerita baru yang dimahukan, semalam seorang ahli UMNO dari Johor, Johari bin Ismail, 49 telah membuat laporan polis di Balai Dang Wangi pada pukul 4:25 petang berkaitan peristiwa di Kubang Pasu tahun lepas. Laporan ini menyatakan Pak Lah telah membincang atur di Mesyuarat Majlis Tertinggi UMNO bertarikh 28hb Ogos 2006 untuk memastikan hak Dr Mahathir untuk bertanding dan dipilih sebagai ahli delegasi Bahagian UMNO Kubang Pasu ke Perhimpunan Agung Tahunan UMNO tahun 2006 dinafikan. Usaha yang dipersetujui oleh Presiden UMNO untuk mengalahkan Dr Mahathir melibatkan usaha satu kempen habis-habisan, menggunakan cara lembut, halus, kasar dan terang-terang, termasuk pemberian rasuah politik berupa wang RM200 dalam sampul surat perang. Akhirnya Dr Mahathir tidak terpilih. Malah, ada yang membuat andaian pengiraan undi pun ada penipuannya. Peristiwa ini telah ditulis dengan panjang lebar dalam Malaysia Today dalam laporan, Watergate a la Malaysia dan dirumus oleh Biggum Dogmannsteinberg dalam tulisannya, Ahli UMNO buat laporan polis terhadap Presiden UMNO. Pada Khamis 28 August 2006, jam 300 petang, bertempat di Bilik Mesyuarat Utama UMNO, Ibu Pejabat UMNO, Tingkat 38, Menara Dato’ Onn, Pusat Dagangan Dunia Putra, Jalan Tun Ismail, Kuala Lumpur telah diadakah sebuah mesyuarat Majlis Tertinggi UMNO. Dalam mesyuarat itu, Minit Mesyuarat Majlis Tertinggi UMNO selepas telah membincangkan secara terperinci usaha menggagalkan mantan Presiden UMNO, YABhg Tun Dr. Mahathir Mohamad untuk bertanding sebagai Perwakilan UMNO Bahagian Kubang Pasu ke Mesyuarat Agung UMNO 15-17 November 2006, dalam pemilihan Perwakilan pada Mesyuarat Agung Tahunan UMNO Bahagian Kubang Pasu pada 9 September 2006 di Jitra, Kedah. Dalam perbincangan ini, turut dirakamkan tugasan tugasan yang ditanggung jawabkan kepada beberapa ahli MKT UMNO untuk laksanakan agar Tun Dr. Mahathir Mohamad gagal dipilih sebagai Perwakilan UMNO Bahagian Kubang Pasu. Setelah menyedari Minit Mesyuarat pada 28 Ogos itu mengandungi perbincangan secara terperinci mengenai niat jahat menghalang mantan Presiden UMNO itu dipilih sebagai Perwakilan UMNO Bahagian Kubang Pasu, maka Presiden UMNO YAB Dato’ Seri Abdullah Ahmad Badawi telah mengarahkan Brig. Jen (B) Dato’ Hussainay Hashim, Setiausaha Kerja MKT UMNO, mewakili Sekretariat UMNO agar tiga muka surat Minit Mesyuarat tersebut dikecualikan dari Minit Mesyuarat asal. Walaupun ditegur oleh Ahli MKT UMNO YB Dato’ Seri Utama Dr. Rais Yatim kerana perbuatan mengecualikan sebarang maklumat dari Minit Mesyuarat yang telah direkod dan sediakan itu sebagai menyalahi peraturan mesyuarat, namun begitu Presiden UMNO masih berdegil. 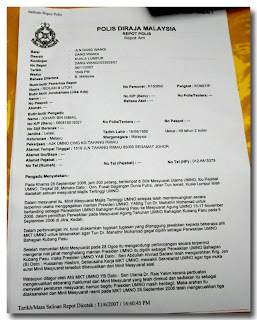 Maka arahan itu dilaksanakan dan Minit Mesyuarat rasmi pada MKT UMNO 28 September 2006 telah mengecualikan tiga helai muka surat asal mengenai perbincangan mengenai usaha mengagalkan pemilihan mantan Presiden UMNO sebagai Perwakilan UMNO Bahagian Kubang Pasu pada 9 September 2006. Oleh demikian, kerana MKT UMNO telah mengesahkan satu Minit Mesyuarat pada 28 September 2006 yang telah di’ubah suai’, maka Saya minta siasatan dibuat kerana ini jelas melanggar peraturan mesyuarat dan ujud unsur konspirasi melakukan ‘jenayah politik’ kepada mantan Presiden UMNO. Media alternatif melaporkan beliau sanggup menghadapi apa jua akibat berikutan tindakannya itu. Laporan ini mungkin pendahulu untuk membawa kepada satu tindakan mahkamah terhadap UMNO. Mengikut perlembagaan UMNO, jika ianya berlaku, keahlian Johari boleh dipecat. Johari dilaporkan berkata, "Saya melakukan ini sebagai ahli Umno yang prihatin. Saya prihatin terhadap penghakisan di dalam Umno". Penulis yakin seorang ahli biasa seperti Johari tidak akan berani mengkorbankan diri melainkan beliau prihatin dan percaya bahaya perbuatan Presiden UMNO kepada parti. Syabas! Ada jiwa si Bongkok masih belum hilang dalam sanubari anak Melayu untuk berani memperjuangkan kebenaran dan menahan penghakisan! Jika seorang negarawan seperti Tun Dr Mahathir menerima layanan sedemikian, apa puila ahli biasa dan rakyat marhaen? Ah! Tidak habis-habis yang melibatkan Dr Mahathir. Baiklah, ini cerita baru juga. Orang-orang akhbar di PWTC menceritakan Era Baru telah dinafikan pas untuk memberi liputan kepada Perhimpunan Agong UMNO terkini. Era Baru adalah satu-satunya tabloid politik yang sudah 14 tahun memberi liputan kepada perkembangan politik UMNO. Mengikut sumber-sumber Era Baru, mereka telah memohon pas itu hampir dua minggu dan telah di "main-main"kan hingga akhirnya diberitahu Setiausaha Kerja Majlis Tertinggi UMNO, Brig. Jen (B) Dato’ Hussainay Hashim enggan mengeluarkan pas untuk Era Baru. Dipercayai keengganan SUK mengeluarkan berkait dengan isu mukadepan Era Baru pada bulan Julai lepas berjodol UMNO Pengecut. Era Baru telah menegur UMNO yang tidak berani mempertahankan kepentingan orang Melayu. Ah! Ini zaman slogan Agenda Melayu, jangan percaya sangat. Inilah UMNO zaman Pak Lah yang sensitifnya jiwa hingga amalan demokrasinya "tidak boleh ditegur dan tidak boleh larang". Kini sudah banyak perkembangan terbaru dan pelbagai peristiwa selama 16 bulan sejak saudaraku Zabidi menulis kepada UMNO Reform. Fikirkanlah! Seseorang yang perlu menahan dan menindas seseorang yang lain dari bersuara adalah seorang yang tidak berkeyakinan diri atau takut kerana salah atau mahu lari dari kebenaran. Fikirkanlah! Seseorang yang perlu menahan dan menindas bukanlah seorang yang mengamalkan keterbukaan, ketulusan dan kedemokrasian. Adakah lagi Siddeq, Amanah, Tabligh dan Fatanah dalam diri pemimpin sedemikian? Layakkah ia terus memimpin? Harap baik dan betul belum dipengaruhi suasana dan keperluan. Dari zaman Tunku Abdul Rahman sampai ke Tun Dr Mahathis, tidak ada slogan seperti Agenda Melayu yang dicipta, tetapi pelbagai dasar dan usaha dijalankan dengan ikhlas dan gigih untuk memperbaiki nasib orang Melayu. Persidangan Agong Tahunan UMNO (PAT) begitu jelas kedengaran isu-isu Melayu - pencapaian, masaalah, rintangan, potensi seterusnya, cadangan-cadangan, perancangan dan pembinaan keyakinan - diperkata dan dibincang dengan penuh kesungguhan. Sejak slogan Agenda Melayu konon dinobatkan pada PAT 2004, ianya bagaikan slogan yang hanya kedengaran pada PAT. Habis PAT, jarang jarang dan kad-dang kad-dang kedengaran slogan ini. Dalam diam-diam, kedengaran satu-satu ketirisan Agenda Melayu dan masaalah orang Melayu terbiar tanpa pembelaan. Apabila kritikan terhadap orang Melayu, diam sahaja Pemuda UMNO. Dalam isu-isu tertentu seperti WPI, ditahan suara orang Melayu untuk bersuara. Pada tahun ini, suara semangat juang bukan sahaja hilang, tetapi komen Pak Lah di dalam akhbar bertambah jelas bernada apologetik, dan defensif dalam menyuarakan Agenda Melayu. Adakah Presiden UMNO sudah malu untuk membincangkan perjuangan mempertingkatkan bangsa Melayu? Adakah Presiden UMNO sudah jelak mendengar lagu Warisan? 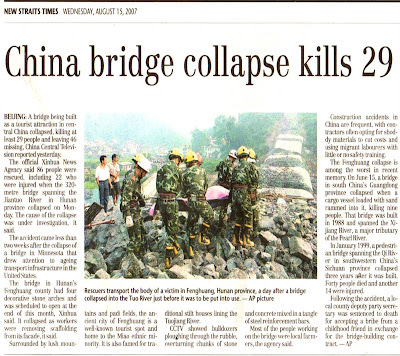 Akhbar New Straits Times (NST) hari Isnin, November 5hb, 2007, tajuk muka depannya terpampang besar “Stop being afraid”. (Berhenti dari takut). Laporan berita NST mengutip temuramah Mingguan Malaysia (Mingguan) dengan Pak Lah dan memberi penekanan kepada orang Melayu untuk bersedia menghentikan pergantungan kepada bantuan kerajaan dan Dasar Ekonomi Baru. Ia juga melaporkan jawapan yang merupakan alasan lemah terhadap kritikan kelambatan beliau dalam membuat keputusan. Dalam penulis merujuk kepada temuramah tersebut di Mingguan hari Ahad November 4hb., terpampang besar di mukadepan kepala tajuk yang tertulis “ ‘Berdosalah saya’ – Perdana Menteri bertekad tidak membiarkan Melayu tertinggal ” dengan muka Pak Lah bagaikan memohon simpati. Temuramah bersama Pak Lah memberi penekanan kepada usaha-usaha kerajaan akan terus memberi bantuan kepada orang Melayu. Intipati usaha tersebut berkisar kepada pembangunan modal insan dan projek-projek koridor ekonomi. Perkara yang ditekankan dalam NST memang ada disebut sebagai desakan dan motivasi kepada orang Melayu. Memang hairan, suratkhabar dari tuan yang sama tetapi kenapa perlu diubah suai hebahan awamnya. Mengapa pula lidah suara UMNO perlu menyampaikan pesanan yang berlainan untuk media berlainan? Mungkin sekali penulis, anak DEB ini, sudah mulai ketinggalan kepada pengguna zaman teknologi maklumat dengan kegagahan dunia pasaran. Bukankah kedua-dua suratkhabar ini berbeza sekali bahasa penghantar, demografi pembaca, komposisi kaum pasukan penyunting, falsafah suntingan, dan nilai komersial? Ah! Suratkhabar UMNO pun perlu mencontohi aturcara Khazanah/GLC dalam menitikberatkan pencapaian KPI yang merupakan petunjuk keupayaan pengurusan dalam tujuan ulung menjana keuntungan. Demikianlah sindiran penulis kepada sikap sebenar pentadbiran Pak Lah tentang kepentingan orang Melayu yang mutakhir ini nadanya agak apologetik dan defensif, dan tindakannya destruktif. Lihat sahaja laporan NST yang begitu apologetik bagaikan segan untuk melaporkan isu Melayu. Malah sepanjang pentadbiran Pak Lah, NST yang didalangi Kalimullah adalah suara pendahulu penghentam Melayu dan Islam (Malay and Islam bashing) dalam pelbagai segi. Lihat sahaja jawapan-jawapan Pak Lah dalam temuramah dalam Mingguan Malaysia rata-rata mengelak persoalan dan menafi realiti __ petunjuk jelas nada defensif. Kertik tajuk laporan-laporan yang dihyperlink - Melayu jangan berpolitik ikut hati, Mana boleh mereka ketinggalan, dan Berdosalah saya . Lihat sahaja, semasa slogan Agenda Melayu tidak kedengaran diguna, polisi-polisi dan perlaksanaan pentadbiran Pak Lah amat destruktif. Pentas yang telah di bina untuk memajukan orang Melayu dalam teknologi kejuruteraan dan tinggi seperti Proton dan MAS di hancurkan. AP dikeluarkan dengan banyak untuk menjejaskan jualan Proton. Teknologi tinggi dalam MV Agusta yang telah diambilalih dilelong murah dan disyaki terompak dari nilai sebenarnya. Hanya menunggu hartanah Proton dijual dengan penilaian murah. MAS yang telah membina keupayaan orang Melayu dalam sektor aeroangkasa telah di hiris jalan penerbangannya untuk di tukarmilik kepada AirAsia, syarikat kepunyaan persendirian. Dari laluan jalanan tempatan dan kini laluan antarabangsa ke Singapura, Australia dan kemungkinan London. Modal insan MAS diberhentikan yang akhirnya memanafaatkan syarikat penerbangan luar negara. Akibat pendekatan strategi baikpulik korporat yang cetek wawasan, pulohan ribuan modal insan Melayu yang berpengalaman, terlatih dan berpakaran tergugur dari memainkan peranan. Usah dicerita lagi kerancakan syarikat-syarikat GLC secara bersistem mengganti pengurus-pengurus Melayu dengan pengurus-pengurus bukan Melayu yang tiada berpengalaman releven. Sepanjang perkara ini berlaku, ia berlaku di bawah mata pengurusan tertinggi dan Lembaga Pengarah GLC yang kebanyakkannya orang Melayu. Mereka yang telah diamanahkan berpandangan stereotaip dan menghina anak bangsanya sendiri. Yang lebih aneh sekali, dizaman slogan Agenda Melayu, boleh diambil orang asing untuk ditempatkan di jawatan tertinggi yang strategik dan sensitif kepada kepentingan orang Melayu seperti di Khazanah Nasional dan Telekom. Dari mula Pak Lah memegang pucuk pentadbiran, berapa banyak syarikat-syarikat dan ekuiti strategik Melayu dan GLC yang jatuh ketangan bukan Melayu dan orang asing. Penulis tidak persoalkan dan faham alasan mikro untuk menjual ekuiti tersebut. Yang menjadi kesedihan penulis adalah bagaikan ada juru jual beriktiraf yang mana usaha menjualnya tidak boleh dipertikaikan. Dari terjatuh ke orang asing, kenapa tiada usaha pucuk kepimpinan untuk menyelamatkannya? Perkara utama kemarahan penulis adalah mengapa kepimpinan Pak Lah perlu berbohong dan berlakun dengan slogan dan permainan media untuk menagih simpati pengundi Melayu di luar bandar? Jika itu arah yang mahu dibawa, katakan demikian dengan jelas dan hadapi akibatnya demi beritiqamah. Kenapa perlu orang kampung perlu dibohongi demi undi mereka? Niat lain, mulut dan perbuatan kata lain. Tiada yang begitu jelas menunjukkan sikap sedemikian, melainkan Koridor Ekonomi. Koridor Ekonomi: Adakah Hebatnya Sungguh Bagai Dikata? Naskhah Mingguan baru-baru ini memaparkan sebuah rencana, Orang Melayu di Koridor Ekonomi perlu bangkit. Seolah-olah sebuah rencana perlu bagi menjelaskan penerangan Pak Lah yang masih tidak jelas. Baru-baru ini dua Koridor Ekonomi yang telah dilancarkan, menambah kepada WPI yang penuh kontroversi. Maka, boleh dijangka Koridor Ekonomi bakal menjadi tajuk perbincangan sebagai "saving grace” (menyelamatkan malu) kelemahan pengurusan ekonomi Pak Lah. Penulis tidak mempersoalkan usaha-usaha membawa kemajuan, jika tujuannya dan limpahannya benar-benar tulin dalam memberi manafaat kepada rakyat dan meningkatkan tahap ekonomi orang Melayu. Malah, penulis amat bersetuju dengan usaha menebarkan kemajuan ke seluroh pelusok negara, luar dari lembah Klang yang sudah mula sejat. Persoalannya, adakah kemajuan yang dibawa betul membawa pembangunan kepada orang Melayu atau hanya membawa pembangunan fizikal bandar ke luar bandar? Sepanjang sejarah, pembandaran tidak pernah menguntungkan orang Melayu. Orang Melayu tidak menguasai ekonomi bandar dan ianya adalah legasi ekonomi kolonial yang pernah dan akan terus meminggirkan orang tempatan. Jika dilihat rancangan NCER, ketara sekali limpahan peningkatan pembangunan pembandaran Pulau Pinang ke Seberang Perai. Betapa besar perancangan pembangunan untuk memindahkan Pusat Lumba Kuda Pulau Pinang ke Batu Kawan yang mana jambatan kedua Pulau Pinang yang menelan belanja RM3 billion dibina untuk menyambungkan ke kawasan "greenfield" Batu Kawan. Tapaknya di Pulau Pinang akan dibangun menjadi Penang Global City Centre (PGCC) dengan 137 bangunan yang akan mercup dan disaran berperanan sebagai pusat logistik NCER. Pihak kerajaan sanggup memberi kontrak pembinaan kepada sebuah syarikat Cina yang sedia mendapatkan pinjaman US$800 juta. Adakah pinjaman ini bermakna pengguna akan membayar dengan wang Amerika? Masih tidak belajarkah kita dari beberapa peristiwa kenaikkan Yen pada tahun awal 1980an dan kejatuhan wang Malaysia pada tahun 1997? 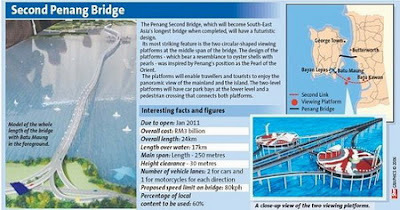 Ada pula perancangan Pulau Pinang akan dibina hub pengangkutan multimodal yang bakal memakan jumlah berbillion-billion di bahagian pulau. Bahagian pulau tidak perlu diadakan jambatan kedua tetapi sistem pengangkutan awam yang menyeluruh dan effisyen. Entah apakah bijaknya dan ertinya ini semua dalam memajukan pertanian, pembuatan, pelancongan dan logistik di wilayah ini dan kepada Agenda Melayu. Berbanyaklah kita berdoa, dibawah ini adalah potongan akhbar berkenaan syarikat yang bakal membina jambatan ini. Yang ketara sekali dalam semua ini taukeh Monsoon Cup, Dato Patrick Lim, yang telah menutup muara sungai Terenganu untuk pembangunan hartanah mewah di Pulau Duyong, yang untung. Projek PGCC, Pusat Equestarian Batu Kawan dan perumahan Batu Kawan haknya. Dari sebuah syarikat hartanah yang kecil Equine Capital, pengembangannya menimbulkan kehairanan penulis. Tidak adakah usahawan Melayu yang berupaya melakukan yang sama? Sekiranya tidak ada Melayu, apa salahnya diagih-agihkan untuk lebih ramai usahawan Malaysia. Suatu masa dahulu Pak Lah kata, jangan lagi orang yang sama dapat? Ini baru Pulau Pinang, apa pula WPI yang begitu menyerlah angan-angan megapolis WPI yang akan dihurai di bawah. Mungkin penulis perlu menerima hakikat, pembangunan bandar mempunyai ciri-ciri tersendiri dan kemajuan luar bandar secara luar bandar. Persoalannya di NCER dan ECER yang mana tanah rizab Melayu begitu luas sekali, adakah pemilik akan benar-benar dapat merasakan nikmat pembangunan dari perancangan pertanian skala besar yang dirancang oleh korporat gergasi? Mudah sekali dikata pemilik tanah boleh sewa atau jual kepada badan amanah bagaikan skim amanah saham. Penulis faham benar ketirisan pulangan pada pelabur di pelbagai peringkat operasi skim amanah saham. Bagi pelabur amanah saham, mereka boleh menjual jika tidak puas hati. Bolehkah pelabur tanah dalam skim amanah hartanah berbuat demikian? Jika tidak boleh berbuat demikian, adakah pemilik tanah Rizab Melayu boleh mendapat penggantian yang lain? Dalam sistem ekonomi terbuka dan liberal yang sudah menjadi morma amalan kini, sediakah pengeluar modal dana berkongsi keuntungan yang adil dengan pengeluar sumber modal hartanah? Persoalan lagi, adakah koridor ekonomi ini benar-benar satu pendekatan pembangunan yang begitu berbeza dan dinamik sekali? Penulis menyedari perincian projek-projek yang menjadi pengerak pembangunan tidak dikhususkan tetapi hanya menjenama nama Koridor Ekonomi. Apa sebenarnya perlu dikumpulkan atau dijenamalan menjadi Koridor Ekonomi? Apa salahnya ditekankan hebahan berkenaan projek yang khusus yang jelas boleh difahami penterjemahannya dan manafaatnya? Setelah ditinjau pengurusan ekonomi mutakhir, bagaikan suatu trend bagaimana perubahan penekanan pengukur pencapaian tahunan kepada bujet tahunan kepada RMK9, Industrial Masterplan (IMP) yang berasakan 5 tahun kini IMP ke 3 menjangkau 2005-2020, dan Wawasan 2020 kini mahu diketepikan untuk menonjulkan Misi 2057. Adakah mungkin Koridor Ekonomi hanya membina satu jenama dan pengurusan persepsi sahaja? Dengan 40% dari budget pembangunan ECER adalah untuk pembangunan infrastruktur, apakah perisian kegiatan ekonomi yang hakiki dan tulin? Koridor Ekonomi yang kini telah dijangka menelan belanja RM670 billion untuk lebih dari dua dekad. Adakah unjuran sedemikian realistik? Adakah perancangan begitu jauh ke hadapan munasabah dilakukan? Adakah ia hanya membina persepsi bagaikan membina istana di awang-awangan? 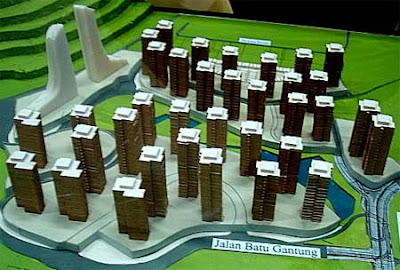 Adakah pembandaran skala agung atau pembangunan megapolis WPI akan membawa pembangunan dan peningkatan untuk orang Melayu? Dengan insentif, kelonggaran dan kemudahan yang diberi untuk orang asing memiliki harta, adakah orang tempatan akan merasa nikmat harga hartanah melambung diluar kemampuan, melainkan hartanah yang ada dijual? Adakah WPI benar mengembangkan pembangunan ke luar Lembah Klang? Dengan peruntukkan Akta IRDA 664 yang begitu menyeluruh dan tidak terbatas kuasa kepada kerajaan persekutuan tetapi begitu halus membelai dan memenuhi kemahuan Singapura, WPI jelas adalah pencabulan semangat Perjanjian Persekutuan Malaya 1948 (post Malayan Union 1946). Ia adalah penjajahan wilayah oleh Kerajaan Persekutuan keatas negeri Johor untuk di persembahkan buat Singapura. Jambatan Johor yang strategik sekali kepentingan dan untuk masa depan Johor Selatan dibatal dengan mudah oleh Pak Lah. Persoalan yang dimajukan oleh Tun Dr Mahathir sudah setahun masih tidak terjawab. Apakah guna berslogan Agenda Melayu, jika hak keistemewaan orang Melayu di kawasan WPI dibubarkan? Masih terigau dalam telinga penulis COO IRDA hanya terdaya menyatakan peluang untuk orang Melayu dalam menjalankan kerja stesyen minyak, kedai dobi, perkhidmtan keselamatan, dan kedai-kedai makan. Adakah ini bermakna pekerjaan dan perniagaan lain diperuntukkan hanya untuk masyarakat antarabangsa dan rakyat asing? Rakyat biar menjadi hamba dan duduk di ghetto WPI sahaja! WPI bukan sahaja sudah menjadi masaalah Agenda Melayu tetapi kedaulatan negara. 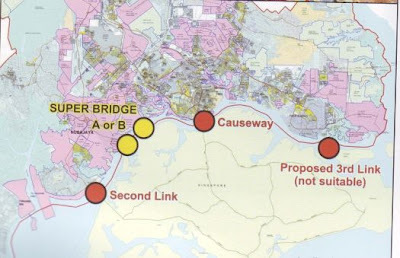 Kini, begitu kuat sekali desas desus bahawa Pak Lah sedia membenarkan Singapura membina dua superbridge. Tidakkah Pak Lah sedar jambatan ini akan memudahkan kereta kebal Leopard tentera Singapura menyeberang ke Johor? Semasa dahulu memegang jawatan Menteri Pertahanan, celikkah matanya semasa diberi taklimat mengenai “forward defense” (sila muat turun article Singapore Forward Defense: A Threat To Malaysia)? Hari ini perbicaraan berkenaan Pulau Batu Putih sudah mula bicara. Apakah yang akan terjadi? Mungkinkah ada pulau lain yang kemudiannya akan tergadai kepada Singapura? Begitu banyak kontroversi mengenai WPI tetapi pembahas UMNO bagai telah diugut dari membincangkannya dengan panjang lebar samada di Parlimen, atau di Konvensyen UMNO Negeri atau di PAT. Ah! Agenda Melayu apa ini? Pada tahun ini, suara-suara amaran telah mula kedengaran untuk meredakan perbahasan demi pilihanraya umum. Simbolik sekali. Seolah-olah perbincangan yang ikhlas mengenai Agenda Melayu boleh ditangguh-tangguh dan tidak sepenting pilihanraya. Adakah perjungan untuk pilihanraya atau kewujudan UMNO untuk memperjuangkan orang Melayu? Penulis mengkagumi dan menghargai deklarasi Dato Najib semalam untuk mengistiharkan Agenda Melayu sebagai Agenda Nasional. Namun, susah bagi Dato Najib untuk menawarkan isi rakyat kebanyakkan. Pada mereka, bukan sahaja Agenda Melayu telah terkubur dizaman Pak Lah, malah kedaulatan negara telah tercabul dan keadaan huru hara telah mula menjejaskan keamanan dan kedamaian yang kita kecapi selama ini. Apa nak jadi negaraku ini? Ya Allah selamatkan agama ku, bangsa ku dan negara ku! Di dalam temuramah Khairy dengan suratkhabar The Star pada Jumaat lepas, November 2hb, 2007, beliau mengaku menggunakan “perlindungan” yang diperolehi untuk membawa perubahan dan merasakan dia telah berjaya membawa perubahan ketara (“push the envelope”). PETALING JAYA: Khairy Jamaluddin says that being the Prime Minister’s son-in-law has provided him “protection” which he wants to use to change things for the better. The Umno Youth deputy chief said he was able to “push the envelope now” partly because of that relationship with the prime minister. “There’s a certain extent (to which) these people in Umno will not go after me. So it gives me ‘protection’ to change things. “If I don’t use this ‘protection’ to change things for the better, then I’m just wasting time and marking my time to go up the ladder of politics. That’s not what I am about. “I want to use this time that I have while I have this ‘protection’ to change things, to change Umno for the better,” he said yesterday during a question-and-answer session at the Kancil Awards Festival Speakers series. Khairy, who is married to Nori, the daughter of Datuk Seri Abdullah Ahmad Badawi, said it was true that this relationship meant he knew which buttons to push and which leaders to pull in to make a particular programme a success. He was asked if his MyTeam football project would have received sponsorship and the wide TV3 coverage that it did had he not been the prime minister’s son-in-law. Thankfully though, he said, the idea was right and its execution worked well, so much so that viewership for the MyTeam programme even topped that of Siti Nurhaliza’s wedding. He said people opened doors in many different ways and sometimes for him people opened the door because his father-in-law is the Prime Minister. He said his goal in life was to contribute in whatever way he could to make Malaysia reach its potential and this was not necessarily through politics. “I always tell my friends and family that if everything comes crashing down in politics, it’s not the end of the world. “If after one day, my father-in-law retires and all of Umno decide to go after me, that’s reality ... politics is my profession and passion but I can live outside it,” he added. He said that having a baby had put things in perspective. “I hope to be in politics as long as possible to change as much as possible and see how things can be improved. 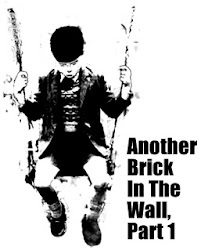 But there’s always something else to life than going up the ‘greasy’ pole of politics,” he added. Khairy also said that he felt strongly about wanting to start a genuine national conversation among people of different backgrounds, ethnicity and religions on Malaysians as a people. “There must be a middle ground somewhere,” he added. He also wanted to push for Malaysians to become automatic voters upon reaching 21, without having to register. Pengakuan Khairy ini jelas menunjukkan Pak Lah telah merela memberikan perlindungan dan kebenaran, dan tidak membangkang penglibatannya dalam politik, kerajaan, sukan dan perniagaan. Tanpa segan silu, Khairy meng”halalkan cara” kepada amalan nepotisma dalam parti, kerajaan dan perniagaan asalkan tercapai tujuan. Q: Some believe that you still have the clean image. Others say that people around you are very influential on you. 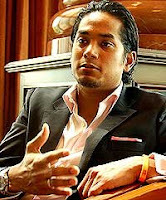 For example, your son-in-law Khairy Jamaluddin. A: Khairy once worked with me. All officers have their roles. They give their reports and views but it is my decision whether to accept or reject their views and decision. When stories came up about an influential 28-year-old in the Government, he resigned and did not want to work with me anymore. But he has to make a living like the others. He bought a small amount of shares and became a partner in ECM Libra and he took his own loans. But there is no proof that he hijacked and took over a government project. Q: Is it a dilemma to have a family member as a member and political influence in Umno? A: I've spoken frankly when he wanted to become a youth member. I remember when Hishammuddin was angry with me, he would say that he decided and suggested that Khairy should be the deputy youth chief. He told me not to interfere. "Pak Lah don't interfere. This is a youth matter and the youth chose who they want. 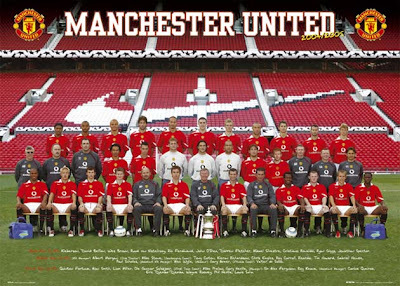 We want him…" he told me. As a youth deputy, he has to do work and how far of an influence he has on the government depends on what he can do and the work he has achieved. I don't think him being the son-in-law is the number one factor. We can't do something just by assuming that he is so-and-so's child. But as someone's child, people want to know how far is his capabilities. 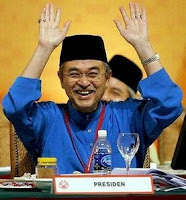 First, he was booed at the Umno AGM. But when he has the capability to raise a motion on youth and economy, he was cheered and praised. Before that it was another story all together. Q. Where is the line between a family relationship and the relationship between a party president and the deputy youth chief. For example, when he comes up with business-related proposals. Does this happen and what happens then? A: When he attended youth meetings, I was told that he never took part in pushing for this or that. When he attends youth meetings, he stands and speaks as an Umno youth representative. He has never spoken, asked, pressurised or threatened the government to give him anything. He has not come to me and said "this is my project and I want you to approve. No, he has not done that as he knows I will not give it to him. Dalam sedutan temuramah ini, Pak Lah menafikan pengaruh Khairy keatasnya dengan menyatakan dia sahaja yang membuat keputusan kepada laporan dan pandangan dari pegawai-pegawainya. Secara tidak langsung, Pak Lah menyatakan Khairy boleh mempengaruhi kerajaan berdasarkan apa yang dia boleh dan berdaya dilakukan. Pak Lah tiada menyatakan dengan tegas bangkangan kepada Dato' Hishamuddin untuk meletakkan Khairy kepada kedudukkan Naib Ketua Pemuda UMNO tanpa tentangan. Walaupun Pak Lah menyatakan permintaan Khairy untuk sebarang cadangan perniagaan akan pasti ditolak, Khairy melibatkan diri dalam ECM Libra yang telah mencolek dan mengambil harta kerajaan, Avenue Asset Berhad. Penulis menesyorkan pembaca melakukan carian di dalam blog ini menggunakan kata kunci “ECM Libra”. Dalam satu pertemuan dengan para sahabat dua tahun lalu, Pak Lah terkejut kerana tiba-tiba dia dikritik keras terutamanya mengenai peranan Khairy yang dilihat sahabat sebagai akan merosakkan Pak Lah. Tanpa segan silu Pak Lah mempertahankan Khairy. Pak Lah kecewa dengan sikap sahabat-sahabat pada malam itu dan mengambil keputusan tidak akan bertemu mereka lagi. Lagi pun dia merasai dia sudah tidak perlu lagi kepada para sahabat ini. Pak Lah hanya perlu kepada sahabat-sahabatnya semasa beliau jatuh dan mahu mencapai kedudukan. Setelah dapat, sahabat-sahabat tidak lagi diperlukannya. Tanyalah sahabat-sahabat Pak Lah yang berselerak di seluruh negara yang kini terumbang ambing mencari rezeki dan rata-rata yang mempunyai syarikat telah terpaksa gulung tikar. Pada Julai 10hb, 2004, sebelum pemilihan UMNO, tiga suratkhabat perdana - Mingguan Malaysia, New Straits Times dan Berita Minggu – seolah-olah telah dikerah memaparkan temuramah dengan Khairy untuk membantu calon Naib Ketua Pemuda UMNO. Semasa itu, dia hanya setahun terlibat dengan Pemuda UMNO. Di dalam temuramah itu, Khairy mengaku pernah terlibat dalam "assisting the PM in carrying out studies and research, writing his speeches, formulating strategies and policies, and such". Peranan sedemikian tentu sekali mempunyai banyak pengaruh terhadap Pak Lah yang diketahui ramai bukanlah seorang yang cekap dan fasih dalam pelbagai subjek, mempunyai sifat malas membaca dan mempunyai minda berfikir yang ambil mudah dan tidak mendalam. Sebagaimana tersiar dalam Malaysiakini bertarikh July 12hb, 2004, seorang ahli Puteri UMNO, Adiba Basir di dalam tulisannya "Pendedahan budaya elitis Khairy Jamaluddin", dia mendedahkan keinginan Khairy untuk menjadi nombor satu dalam apa yang diceburi, suka di puji, dan ianya seorang yang sukakan kuasa dan tahu menggunakan kuasa. Suatu pengetahuan umum dikalangan ahli-ahli UMNO bahawa Hishammuddin and Abdul Aziz Sheikh Fadzir terpaksa memujuk calon-calon lain untuk mengundur dari bertanding jawatan Naib Ketua Pemuda UMNO untuk memberi laluan. Maka menanglah Khairy tanpa di tentang. Walaupun dia menyatakan adalah baik sekiranya dia bertanding sebagaimana yang dilakukan oleh Dato Mukhriz, jelas sekali ia suatu pembohongan kerana tahun ini Khairy dipilih sebagai Timbalan Presiden FAM tanpa pertandingan. Penulis masih ingat dalam satu temuramah dengan Mingguan Malaysia sebelum Perhimpunan Agong UMNO tahun 2005, tahun berikut selepas peristiwa Khairy di boo, Pak Lah sendiri mempertahankan Khairy dengan meminta ianya diberi peluang. Suatu lagi bukti Pak Lah tidak berselindung mahu mengetengahkan Khairy. Apakah yang membuat Khairy berani membuat pengakuan sedemikian tidak dapat dijangka? Kemungkinan sekali kedudukkan Khairy sudah begitu kuat hingga sebarang perkara negatif tidak dapat mengegarkan kedudukkannya di dalam Pemuda UMNO dan parti. Suatu yang mungkin adalah pengakuan ini menumpulkan tuduhan hubungan anak menantu terhadapnya kerana ia sudah diakui dan terbuka. Penulis boleh memberi toleran dan menyedari realiti disebalik sesetengah amalan nepotisma kerana penerimaan masyarakat kita. Namun, bagi anak menantu sendiri diberi peranan yang begitu komprehensif dalam "assisting the PM in carrying out studies and research, writing his speeches, formulating strategies and policies, and such" adalah tidak professional sekali. Adakah sepatutnya proses perancangan dan perlaksanaan kerajaan diletakkan hanya kepada bahu seorang sahaja? Maka tidak menghairnkan polisi dan rancangan yang sedang diimplementasi, khususnya polisi awal membatalkan jambatan Johor, polisi kerajaan mengenai MAS-AirAsia, polisi AP/“downsizing” Proton, dan mereformasikan GLC, amat pelik dan janggal sekali justifikasinya. Apa yang boleh diharap dari fikiran anak muda 28 tahun yang tidak pernah ada pekerjaan tetap dan tiada berpengalaman dalam perangkaan dan implementasi polisi. Memandangkan polisi-polisi ekonomi kerajaan mutakhir ini yang hanya lebih persepsi hasil taktik penjenamaan dan pembungkusan, tanpa pengisian strategi pembangunan yang benar-benar jitu dan komprehensif, tidak hairan ianya dilahirkan oleh rakan-rakan anak muda ini yang lebih selesa sekali dengan budaya media dan pemasaran. Dari penelitian penulis kepada laporan temuramah Khairy dengan The Star berkenaan kepelbagaian kaum dan agama, ia telah jelas memberi imbasan sebab kesunyian Pemuda UMNO dalam isu-isu yang begitu jelas “Malay and Islam bashing” dan telah membawa kucar kacir keamanan dan kedamaian antara agama dan kaum. Adakah kebenaran disebalik kata-kata Khairy serta rakan-rakannya di tingkat empat mahu mendalangi kemasukkan agenda sosial barat yang liberal? Ramai yang berpendapat Khairy dan rakan-rakan seangkatannya ini begitu tiris sekali ciri nasionalisme dan patriotisme mereka. Tidak hairan anak-anak muda yang begitu kebaratan pemikiran menerima pendekatan liberal dan laisse fairre tentu sekali asyik untuk membawa perubahan yang “push the envelope” dari kemajuan yang hakiki. Pengakuan Khairy memberi bayangan bahawa mereka sudah tidak ada malu dan berselindung lagi. Penulis tidak dapat dibayangkan apa akan terjadi, selepas pilihanraya umum dan mandat baru telah diberikan kepada Pak Lah. Adakah UMNO sedar dan mahu melakukan sesuatu? Its a Bloody Long Four Years! Abdullah bin Ahmad (bin Badawi) ascended to the post of Prime Minister of Malaysia on October 31st, 2003. Since then, its been terribly a bloody long four years. TV3 Primetime News yesterday televised at the Malay Rulers Durbar (read Wikipedia here to know what it is), the Royal Highnesses The Malay Rulers presented him a cake. If there is still any ounce of common sense within him, he should understand that the cake is not to commemorate but to send a message. The least being a reminder that they are aware of his four years premiership and sufficient time and chance given to prove his mettle. It's a tedious and cumbersome effort to write about a man not only with an endlessly long list of follies, but the list still grows by every other words he utters, every other gestures he does, and every other thoughts of him one hear of. Its frustating to even attempt to further translate into words the weakness of his character, the messiness of his leadership and administration, the hipocrasy of his words, act and image, and just plain incompetence. Thankfully there is this poem from a comentator in Tunku blog here to help describe. Who led his party to a resounding election victory. By his humble and Mr. Clean personality. Lack of evidence or is he fooling us secretly? Except for some broad points outlined in theory. With all the accusations, what is fiction and what is reality? But his son claimed ignorance and that's the end of the story. Which happened right under the nose of the PM-led Finance Ministry. But I don't see the newspaper issuing any apology. I wonder whether the Agong requested for one specifically? Except for the fact that there was a major flood in our own territory. Tun M's pet project is certainly going awry. He must be thinking everything's hunky-dory. 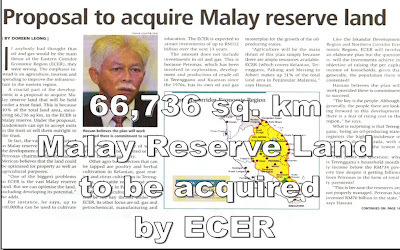 While others argue the southern one will end up as LKY's colony. From promoting judges unfairly to always being sleepy. As long as the person is capable and thrustworthy. With Abdullah, much hope, yes hope, was placed upon him to consolidate and put a human side to a fast developing Malaysia. After 22 years, Malaysian was ready for a new person at the helm. No more that dictator, some would say. Alas! Immediately upon the landslide 2004 general election victory, his true self began to appear - not that of the public image he cultivated or the promises he made for General Election. The pre-ECM Libra-Avenue merger corporate moves was the early indication that alerted me, if the imprisonment of BSA Tahir under ISA earlier had by passed me. After all, everyone, me included, was lost in the jubilation of a new leadership and the excitement of a new broom. Since the ECM Libra Avenue debacle, many more surfaced and it's been an endless flow of disputable decisions and actions. If UMNO was able to fight the British against the installation of Malayan Union in 1946, one wonders now did they really do so then. Where has that tenacity to fight and struggle (berjuang)? Perhaps, one may today wonder if such a sense of struggle really exist. It appears to have lost it forever. Despite grouses coming from the grassroots, has UMNO leaders lost its sense of purpose? Are they that easily numbed by the trapping of position, money and what comes with it? Are they gullible enough to take in hook, line and sinker the excuses spewed by leadership and its propaganda machine? Are they numbed and inresponsive to the predicament of the people and country? Have they cared less to the future of our sovereignty that they seemed willing to outrightly support those covorting with thy enemies? Yet with such state of the country, people and party, there are willing apologist defending this pathetic-ness. One wonder what makes them disillusioned into believing that they are doing a patriotic act to defend an institution and country and not a dunce in leadership with mediocres as supporters, novice as advisers, and gluttons as son and son-in-law. As Tun Dr Mahathir said, "We deserve the leadership we have chosen". Some may have hated him for whatever perceived past. Whilst, some may have missed and prefered his described benevelont dictatorial ways. Do we just dwindle and complain of the past? Do we spend our precious time laying blame, spend more time with retaliatory responses, and back and forth arguing over it? Whatever, I am not willing to waste my time for such wasteful endeavours of mere conversations. Perception of unfair, arrogance and undemocratic for my refusal to listen is unimportant now (sorry...). Tun's words eschewed much truth, lots of it. Perhaps, its our own mediocrity that elevate such mediocre to an improper pedestal. The past is for historian to ponder over and for doers not to delve any more. More so, when "how" is more pertinent than being accurate about the past "why". 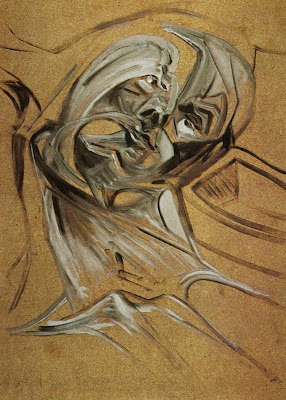 Something need and can be done now rather than engaging in endless discourses. Something need and be done now than bearing to shoulder consequences from the continuance of such mindless and shallow state of affair. If such obvious state needs convincing, I have to apologise that I am not wiling to spend time to teach and instill some critical thoughts. It's just unfortunate that blind loyalty and perpetual leadership remains part of the living vocabulary of many. It's just a pity that many would succumb to place their belief in a leadership surviving on other's effort in the past but pass up as their own; leadership floated by mere perception, distraction of attention, and rebranding / repackaging; and leadership totally lacking in any substance. It is timely that UMNO make a decision and now to remain relevant. Lest, we wish others to make that decision for us. If we are to believe that our ideology, practicality and ability to govern will provide that balance of unity for progress, then something need done now!